Looking for Kuch Kuch Hota Hai songs? It is nice to listen to songs from such classic Indian movie on the weekend. As we all know, Kuch Kuch Hota Hai (1998) is an Indian romantic movie. Also known as KKHH, Kuch Kuch Hota Hai was a smash hit at that time, similarly, the movie album in the same name. Even today, there are still fistfuls of people searching and downloading the old hits of KKHH. So, today, let's have a look at the nitty-gritty of Kuch Kuch Hota Hai songs and the movie soundtrack download resources. After the release, the film album received accolades from the industry. Among the eight songs of Kuch Kuch Hota Hai album, the title song ranked the forefront of RIM. Also, the whole album was the well-received film album of the year. The music success owes much to Jatin-Lalit (Jatin Pandit and Lalit Pandit), the famous Indian movie music director. The brothers have composed hugely popular film scores. Besides those tracks in Kuch Kuch Hota Hai, songs from popular films, like Jab Pyaar Kisise Hota Hai, DDLJ, Yaara Dildara, etc. were written by Jatin-Lalit. In this part, I'd like to make a list of songs in KKHH album. Kuch Kuch Hota Hai is the title track of the film. In fact, there are two versions of this song. Moreover, one of the tracks was sung by Alka Yagnik in Sad version. Anyway, Kuch Kuch Hota Hai has been voted as the top movie song of the previous decade. With the rhythmic beat, Koi Mil Gaya became the best song in KKHH album. The song was performed by Udit Narayan, Kavita, Alka Yagnik and Krishnamurthy. However, you can feel the relationship between the two heroines and the leading role. As the second song with a length over 7 min (Koi Mil Gaya is the longest one), Saajanji Ghar Aaye sounds in similar rhythm to Mehndi Laga Ke Rakhna in DDLJ. Maybe, it is because of the music that was all composed by Jatin-Lalit. With best friendship motif, Yeh Ladka Hai Deewana features pleasant and lively melody on percussion and ends with a light and peaceful tune. This song reflects the scene when Shah Rukh Khan and Kajol fighting and making up during their basketball playing. If you have seen the movie, you can feel the broken-hearted moment when the heroine misses the hero after their separation. Tujhe Yaad Na Meri Aayi is the saddest song in Kuch Kuch Hota Hai. So sad is this song that some would even listen to cry in 2019. Raghupati Raghav is a bhajan in Kuch Kuch Hota Hai film. As the last song in the album, Ladki Badi Anjaani Hai comes with decent percussion. Step #1. Install InsTube song downloader. Step #2. 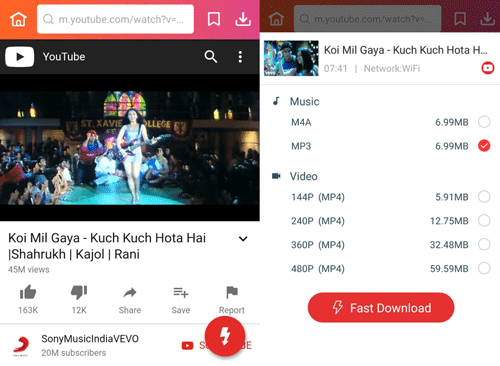 Launch InsTube, find songs from Kuch Kuch Hota Hai, for example, Koi Mil Gaya, from YouTube, Dailymotion, Vevo, or other music video sites. Also, you can paste the URL to the search bar. Then, tap the red download button. Step #3. Select MP3 song format or MP4 and tap “Fast Download”. Also, it is available to download Kuch Kuch Hota Hai full movie-related videos. 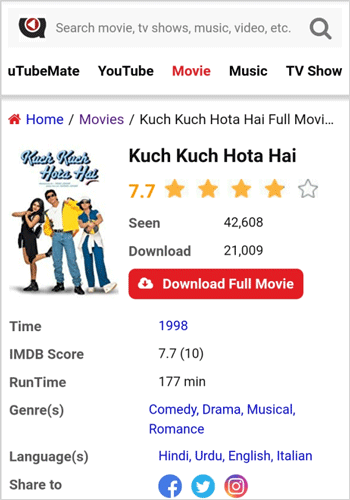 Way #1: You can use InsTube movie downloader to get Kuch Kuch Hota Hai full movie in MP4 format from Dailymotion or YouTube. See the download method of Kuch Kuch Hota Hai songs above. Note: If the links of Kuch Kuch Hota Hai songs are Not Working anymore, please contact support@instube.com, and we will update the film song resources as soon as possible.